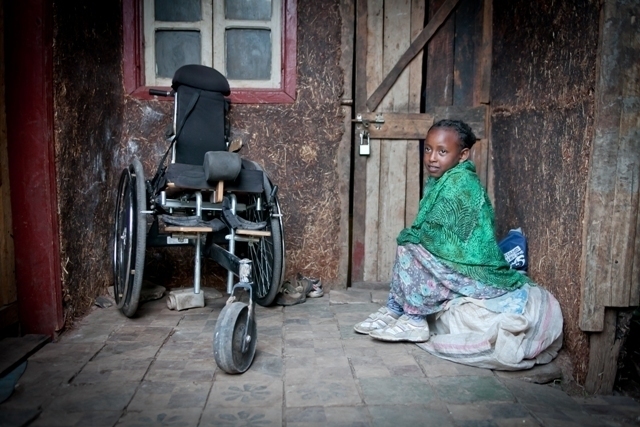 Ten years old and severely disabled after being injured by a cluster bomb, Grum could only dream of going to school. That was until Stand by Me heard of her situation and offered her a place at the Bethany School in Ethiopia, where she could gain a good education without any cost. Grum was six years old when she accidently triggered the cluster bomb, while playing with her friends near her home. The bomb caused devastation and left Grum unable to use her legs. Grum lives with her parents in Bekoiji town, an extremely poor town where clean running water and daily food are scarce, and they could not afford the cost of medical care. Instead, Grum’s mother tried to care for Grum at home, while looking after the rest of her family. Grum’s mother makes a little money making and selling bread, and her father is a labourer. They live in a rented, one-room mud house in extreme poverty. When Stand by Me heard of Grum’s condition, we immediately investigated how we could help, and we bought Grum a wheelchair. We accepted her into the Bethany School where she is now receiving a free education and food, and we arranged medical help for her condition. Grum enjoys going to school and likes learning English. She loves to go to church every Sunday. Just like other children, she has a favourite colour red, and she likes to draw pictures. When she grows up, she wants to be a doctor so that she can help treat people like herself. Grum is the first child in our Bethany School who is disabled and we have gone the extra mile to fulfil her needs. We think she’s worth it. We are going the extra mile for our other kids around the world this Christmas too, by buying every child in our homes a pair of pyjamas. We would love to extend that to all of the children in our day care centres too, who have very little. If you are interested in helping, visit our Pyjama Appeal today.